***** The Doghouse Grille, 5430 Military Trail, Jupiter, Florida 33458, (561) 619-9680. 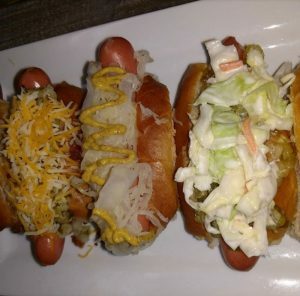 Got a real good sports bar for you guys to checkout- The Doghouse Grille in Jupiter. 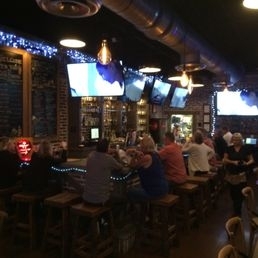 Real simple concept working here- inside table/booth- outdoor table seating, handful of flat screen TVs, beer/wine bar, appetizers/ salads/ soups/ mini hot dogs with tons of toppings/ burgers/ sandwiches/ wraps, open 7 days a week 11am-11pm. 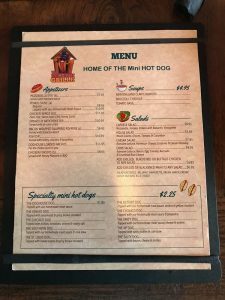 Last night, Jeff Eats and Mrs. Jeff Eats “discovered” The Doghouse Grille (which advertises itself as- The Home Of The Mini Hot Dog) and I gotta tell you- we really enjoyed the joint! 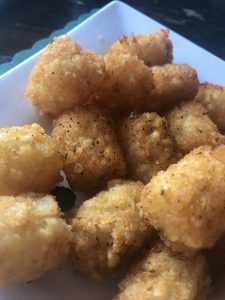 Following the old French adage- “When in Rome do as the Romans do”…we did 6 mini hot dogs and threw in orders of tater tots and french fries for good measure! Trust me when I tell you, real good stuff! 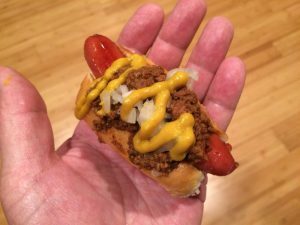 For you guys wondering as to exactly how-big the mini hot dogs were/are? Well wonder no more- and I assure you that the pictured hand does-not belong to the Jolly Green Giant! Like I said 3 seconds ago, Jeff Eats and Mrs. Jeff Eats did 6 mini hot dogs, tater tots and french fries. 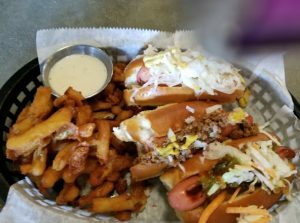 The promise here, the next time we eat at The Doghouse Grille- we’ll definitely make it our business to try some of the delicious looking – burgers, soups, salads, sandwiches and wraps which other patrons😜 were dining on- and update this tale for you guys! 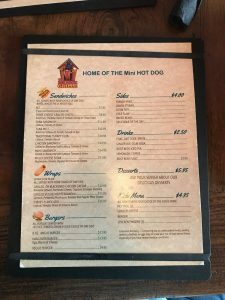 You can check menu/prices/info at doghousegrille.com.